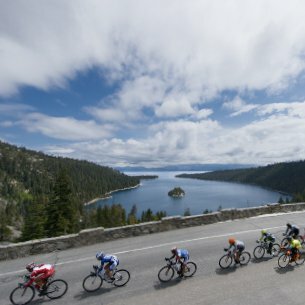 Highlights of the Amgen Tour of California race at Lake Tahoe – both men’s and women’s – will include iconic vistas along the 72-mile circumference of the lake as well as spectacular backcountry terrain through Hope Valley. The routes will challenge more than 350 of the world’s top cyclists. Athletes will put their strength and muscle power to the test as they climb, descend and break away along steep and winding stretches of the Sierra at the 2016 Amgen Tour of California stages Thursday, May 19 at Lake Tahoe. The men’s elite race Stage 5 will begin in Lodi, Calif., and finish at Heavenly Mountain Resort’s California Base Lodge in South Lake Tahoe totaling 132.4 miles. The women’s Stage 1 will also start/finish at Heavenly totaling 72.7 miles.